Since 2011, the start of the Syrian uprising, the mysterious disappearance of several pigeon breeders (kashash) across the lands is evidence of how Syrian skies have become a maelstrom of fire. The cities’ rooftops, previously occupied by many of them, now serve as vantage points for all forms of authoritative representation, if not turned into ground zero rubble. 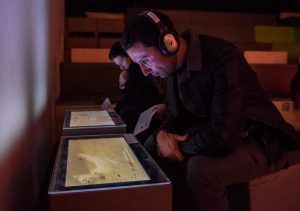 Together with 22 artists, writers, and thinkers from 10 countries, curator Alma Salem explores the traditional Syrian practice of pigeon training, the stories behind it, and its space in the collective Syrian memory. KASHASH, its artworks, its artists, its researchers, and its pigeons reclaim the rooftops as personal and intimate transcendental popular spaces. KASHASH is an artistic research project resulting in an exhibition that will tour with Dancing on the Edge Festival. 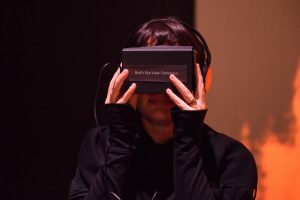 The exhibition contains (video) installations, a photo series, essays, a Virtual Reality experience, and a graffiti guerrilla campaign. A publication on the entire project will come out in the spring 2018. KASHASH is the first project by Syria Sixth Space, a new, independent, non physical, contemporary curatorial platform founded by Salem. A conceptual space where artists and audiences can meet, free from the limitations of geographical borders, time boundaries and censorship. It stimulates innovative digital and virtual art forms and attempts to make visible the invisible. Participating authors & artists: Hassan Abbas (academic and writer), Rasha Abbas (writer), Basel Abdo (technician and IT expert), Ziad Adwan (playwright), Dima Al-Chukr (critic and writer), Abed Al-Hakwati (filmmaker), Sarmad Al-Jilane (activist and journalist), Abdullah Alkafri (playwright and arts manager), Jumana Al-Yasiri (researcher and arts manager) Khaled Barakeh (visual artist), Ibrahim Fakhri (graffiti/visual artist), Omar Imam (photographer), Hanan Kassab Hassan (art scholar and writer), Liwaa Yazji (filmmaker, writer and poet), Anita Mouccadem (designer), Khalil Younes (visual artist), Marieke Odekerken (photographer), Astrid Rijbroek (academic), Mey Seifan (choreographer), Liwaa Yazji (filmmaker, writer and poet), Natasja van’t Westende (programmer and arts manager), Wannous Dima (critic and writer), Esther Wienese (writer). 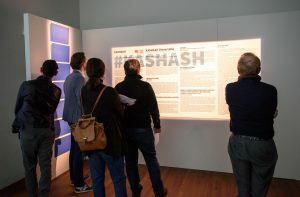 KASHASH is a continuous exhibition with free admission. Curator’s tours of the exhibition can be booked with a reservation. 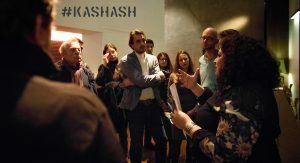 In the KASHASH Talks, panel discussions held during Dancing on the Edge Festival, curator Alma Salem and her guests dive into the different themes of the project. Admission to these talks is free. Pigeon image © Ibrahim Fakhri. For more info on the project go to www.almasalem.com.